Those are cute drawings, but I'm confused. 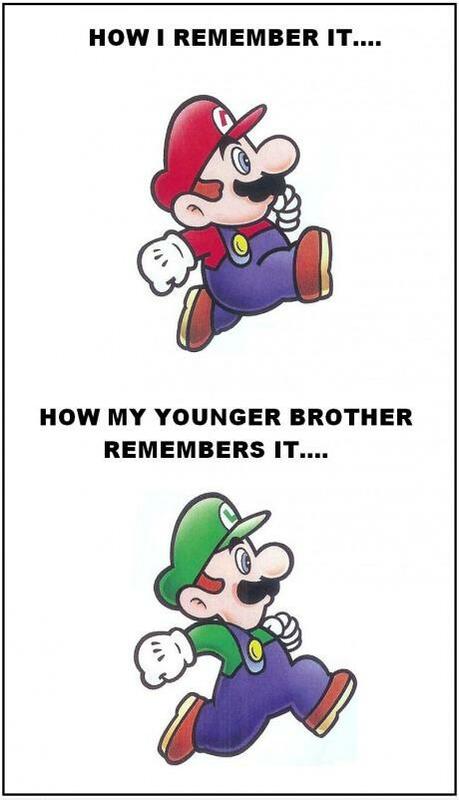 Why does the younger brother remember it as Luigi? Hey there Betty. lol The older brother is always first player so he would play as Mario. The younger brother would be second player, so he would play as Luigi. Hey there Natasha. I love this. Had me cracking up when I first saw it! lol, ohhhhhhhhh! That makes a lot of sense! I thought that maybe it had something to do with the game. For example, isn't there a super mario game that had Yoshi as the main character? Maybe not, but once he came out in the games, then they could actually have another photo where it says I remember sm as Mario and my younger bro remembers it with Yoshi. What do you think?